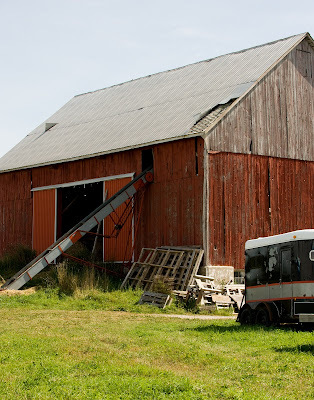 A trip out to a friend's farm turned up this working barn photo - a red barn surrounded with the tools of farming - parts of wooden crates, an old lift for getting the hay up into the hay mow, and off to the side a horse trailer, used for transporting the horses used on the farm. Although this is a working barn and the door system is pretty new, the barn is in need of some minor repairs - the roof needs some new tin pieces, and a few of the barn boards are in need of replacing but ... a weathered old barn is often a sign of a seriously busy farmer! The next one is from the same farm above - part of a field used for the cows to graze, with islands of trees here and there, and some pretty big rocks. 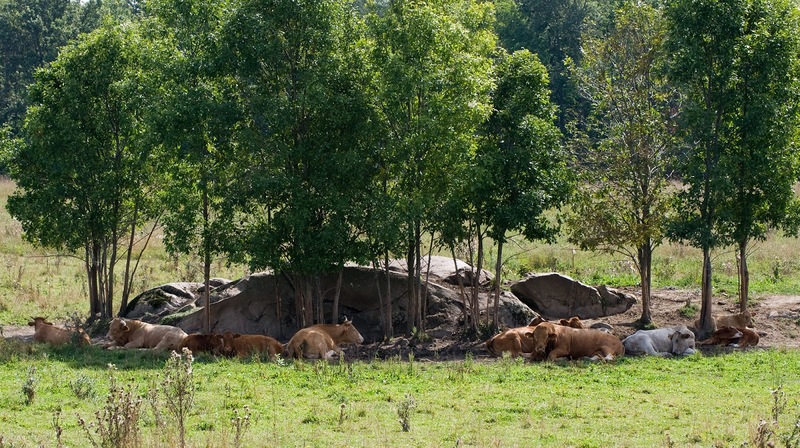 These areas provide shelter from the hot summer sun for the cows, seen here in this photo laying in the coolness of the shade. 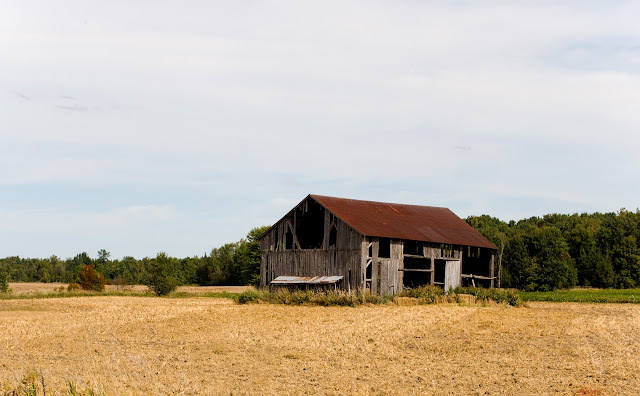 This old weathered barn with many of it's boards missing and red metal roof make a nice rural scene when surrounded by the fall fields and with it's backdrop of green trees. The barn stands by itself in the midst of working fields, though it isn't used any longer. From a backroad we seldom travel on came this photo of an antique tractor sitting in an untended field of what used to be farmland. Now, it's filled with weeds and wildflowers and it's apparent the fields haven't been used for some time. 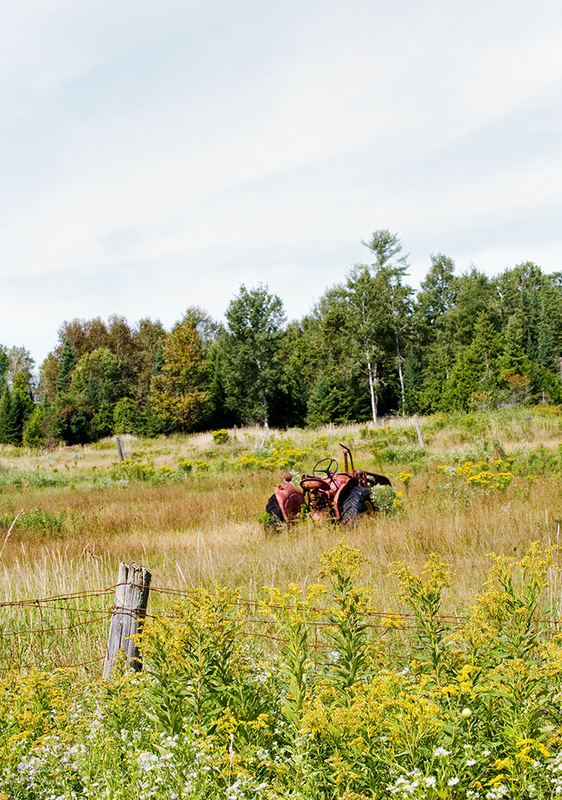 The post and wire fence is rusting and rotting and covered by ragweed and wildflowers. The field beside this one is filled with a myriad of old cars and car and tractor parts, and to the right of this field sits a hidden junkyard. Another farm field passed on our travels through the surrounding countryside - this one is well-tended, and contains grazing cows off in the distance. 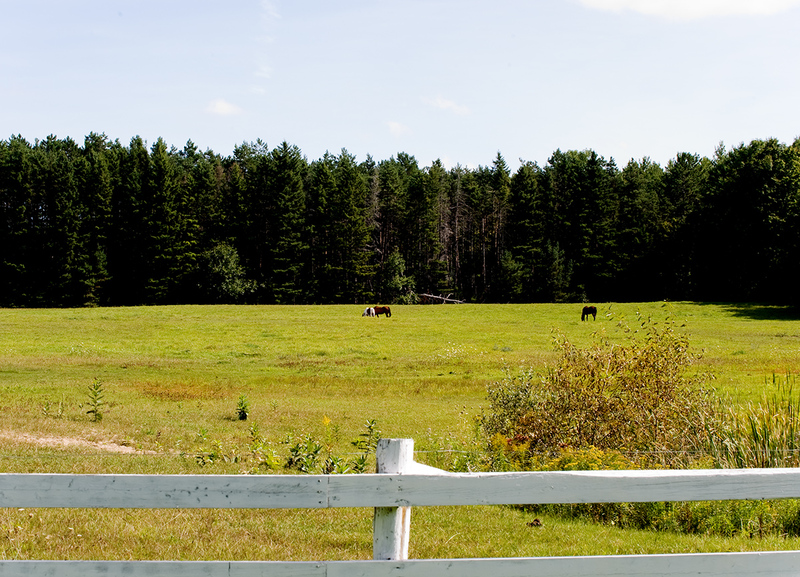 It's background is a thick row of mixed tree species, while in the foreground you can see the need white wooden ranch-style fencing. 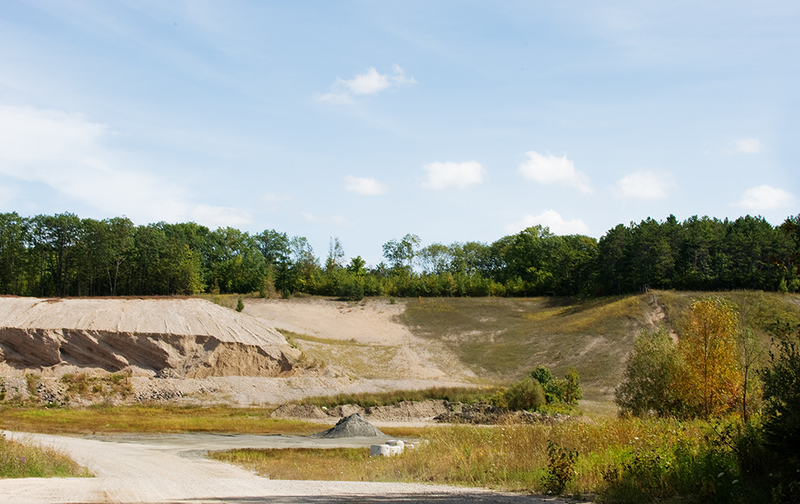 Two views (above and below) of an open-pit gravel and sand mine. Passing this area, the entry is somewhat shielded the trees and berms along the roadside, and if you aren't looking closely you may not see it's entrance. 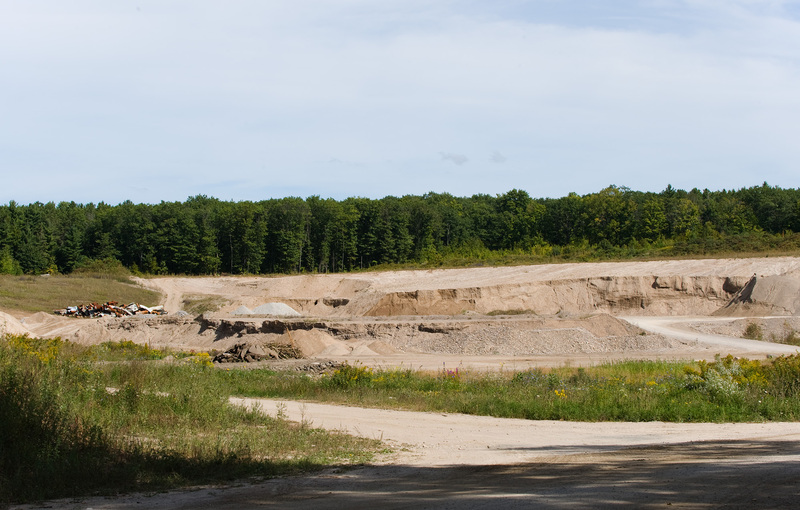 At the upper rear edge you can see the beginnings of a berm, topped by trees that act to shield the surrounding homes and farms from the view of this pit mine.